Grab a seat in front of this beautiful gazebo. Here you can join us as we exchange our vows. Don't forget sunglasses or a hat. Dinner at 5 in the Silver Room. 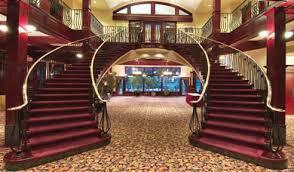 Head up this amazing staircase and enjoy a buffet dinner with us. After dinner we can all celebrate with drinks and dancing.